Wanda S. Henry is a doctoral candidate at Brown University and a Brown-Wheaton Faculty Fellow at Wheaton College where she teaches about the social history of death. Her dissertation investigates the women who searched and buried the dead in early modern England. Our society often imagines people in the past as having lived and died much as we do today. Yet, those nostalgic ideas rarely include men and women covered with lice and vermin and living near waterways clogged with human and animal waste. The stench alone would be enough to kill someone today, and back then, the prevalence of raw sewage did our ancestors little good. From 500 to 1500 CE, the typical lifespan was about thirty-five years of age, and into the nineteenth century, most people did not live much longer. Yet, roughly seven per cent of the population of England in 1581 was over sixty years. Infant mortality drastically lowered the average age because approximately one-third of children never reached their first birthday. Also, contrary to the belief that women risked death with every pregnancy, the mortality rate for women in childbirth was around six to seven per cent. Babies have always been at greater risk for dying than mothers. Writing an overview of causes of death through history runs smack into the problem of sources. While archaeology has led to modern medical assessment of some human remains, most historians rely upon textual evidence to understand the past, and much to the delight of those same historians, people did not think the way we do today. In ye olde England and Victorian times, “Suddenly by the Visitation of God” appeared regularly as a cause of death in parish and civic records. Furthermore, retro-diagnosis is problematic due to the sketchy nature of contemporary evaluations. Medical practitioners and lay people alike attributed cause of death to symptoms rather than the underlying cause. For instance, with no actual evidence for germ theory until the late nineteenth century, fever, not infection, was viewed as a killer. Europeans understood the body in terms of the four humors of Hippocratic medicine from the time of the ancient Greeks up to the nineteenth century. Trained medical doctors knew no more about the body than midwives, barber-surgeons, and folk healers, and all these medical practitioners emphasized situations that today’s medical experts would find trivial if not completely irrelevant. Some sixteenth-century physicians were derisively called “piss prophets” for diagnosing illness without seeing patients but by studying, sometimes tasting, urine samples. 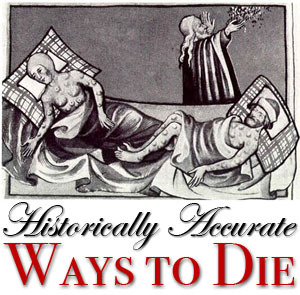 Nonetheless, a lack of facts has not stymied historians or anyone eager to share an opinion, and therefore, this essay offers a summary of historically accurate causes of death. During pre-historical times, hunter-gathers tended to die before twenty years of age by trauma. Accidents, such as falls or attacks by animals or other humans proved lethal. If the individual survived the encounter, few measures existed to stop bleeding, infection, or other complications, and companions were inclined to abandon the sick and injured. Only after humans settled into communities, sustained by agriculture, did the average life span rise to the mid to late twenties. Death by accident continued to occur, but disease represented the most common cause of death in this era of sedentary life. Farmers and peasants domesticated animals as a source of food, and the animals, in turn, shared diseases, including chicken pox and measles, which killed humans. The migration of people from rural areas to towns made economic sense and allowed for advantages in communal living, but life in the big city held its own dangers. People ultimately could not run away from disease. City dwellers had shorter life expectancies than country folk because poor sanitation and overcrowding encouraged the spread of bacteria and viruses. From Biblical times, plagues have wiped out entire communities. Yet, the term, “plague,” is a generic name for death-dealing epidemics that varied from typhus to bubonic plague to smallpox to sweating sickness and several other illnesses. Plague epidemics typically spread along trade routes and through port cities as those places represented focal points for merchandise, travellers, and vector-born diseases. Once contagious illnesses arrived in cities and towns, high-density populations proved a breeding ground for pestilence, and disease radiated out to locations further afield. Bubonic plague haunted western Europe from 1347-1350 when the Black Death killed between thirty and fifty per cent of the population, about twenty million people, and it lingered for nearly four hundred years through an uncountable series of recurring epidemics. Smallpox occurred in ancient times but earned its name only after syphilis appeared in the 1490s. Syphilis was known as the Great Pox or the French Pox or the Italian Pox – one’s prejudice decided the term. Smallpox killed about one third of its victims, resulting in some 400,000 European deaths annually until the end of the eighteenth century. Historians credit Lady Montagu in 1721 with bringing inoculation to England from the Ottoman empire, and Edward Jenner in 1798 with discovering and promoting vaccination. Only in 1977 was smallpox eradicated. Cholera was known as the blue disease for the cadaverous appearance it caused through dehydration due to severe diarrhea; the tainted feces then spread the disease to others usually through inadequate or nonexistent sewage control. It came to Europe about 1817 and spread to England in 1832. Poor sanitation led to recurring epidemics of cholera until 1854 when Dr. John Snow tracked an outbreak to a water pump in Soho, London. Better hygienic practices in medicine and public health made for measurable declines in death by infectious diseases, but those efforts did not stop influenza in 1918 when an epidemic known as Spanish flu killed between twenty and forty million people worldwide. That influenza pandemic was one of the worst catastrophes in history partly because some three to five per cent of the world’s population died and also because healthy men and women died along with the very young and old, the typical victims of epidemic disease. From ancient times to today, societies have adopted various religious and medical interpretations for illnesses. For thousands of years, most peoples, Jews, Christians, and Muslims in particular, believed that God sent sickness and death as a scourge for sin. Prayer was often the response and a widely accepted viable cure. While most belief systems allowed for protective measures, heaven help the poor sinner who sought treatment from a medieval or early modern European medical practitioner. As the saying goes, the cure was often worse than the disease. Physicians prescribed purgatives to expel toxins and balance the humors. Mercury and arsenic were common cures. Mercury, administered by mouth and as a topical ointment, could result in nausea, fainting, impaired balance, cramps, diarrhea, swollen lips and tongue, ill-smelling breath, spongy gums, and finally death. Medical men and midwives frequently recommended laudanum, a combination of opium and alcohol, to sooth teething babies. Some thousands of children died of laudanum poisoning in mid-nineteenth-century England. Bloodletting was another common response to illness as well a treatment for concussion. Sometimes, it helped, but of course, loss of blood was dangerous, and invasive surgery was simply a bad idea. Patients died from shock or infection. Surgeons only used anesthesia from the late nineteenth century and antibiotics from the early twentieth century. The vernacular terms for causes of death appeared in Bills of Mortality, published in London weekly from 1603 to the 1840s. Vestrymen sent women as “searchers of the dead” to examine corpses and determine causes of death for all those who died in London parishes. Much like the physicians of the day, women searchers attributed death to symptoms rather than disease, and medical historians have only reasonable assumptions for the actual causes. “St Anthony’s Fire” for ergotism which was caused by a fungus in rye and led to convulsions before death. A glandular swelling in the neck was often labeled “Kings evil” or “scrofula,” and the purported cure involved the “royal touch” of the French or English monarch. While “old age” appeared regularly, the bills and nineteenth-century registrars also listed “decay of nature” as a cause of death. Both the young and old could die by “decline,” which involved failing vitality, likely caused by lingering but undiagnosed disease. Up to World War I, people mostly died at home. While the Byzantine Empire and the Islamic world tended to the sick in hospitals from the early middle ages, western European hospitals initially served travelers and later became homes for the aged before catering to the sick poor by the sixteenth century. Even then, the presence of infection made hospitals hazardous places. Death by bacterial infection, often streptococcal, called puerperal fever or childbed by contemporaries, occurred more frequently when women delivered babies in birthing hospitals than if they stayed at home. Hospitals have obviously enhanced their care, and a combination of modern medicine, improved sanitation and housing, and better nutrition has led to longer life expectancies. From the twentieth century onwards in developed countries, people generally die from chronic situations, typically cancer or organ failure as long lives strain the functioning of hearts, livers, and brains. For the most part, men and women die in hospitals or nursing homes, although the hospice movement has encouraged some few to opt for alternative measures by expiring at home among loved ones or in smaller hospice facilities without invasive medical attention. In spite of all the many technological advances, people keep dying. Fleming, Robin. “Bones for Historians: Putting the Body Back in Biography.” In Writing Medieval Biography: Essays in Honour of Frank Barlow. Edited by David Bates. Woodbridge, UK: Boydell Press, 2006, 29-48. Kellehear, Alan. A Social History of Dying. Cambridge: Cambridge University Press, 2007. Walter, John and Roger Schofield, editors. Famine, Disease and the Social Order in Early Modern Society. Cambridge: Cambridge University Press, 1989.
excellent, medical schools should have this as part of their required reading.